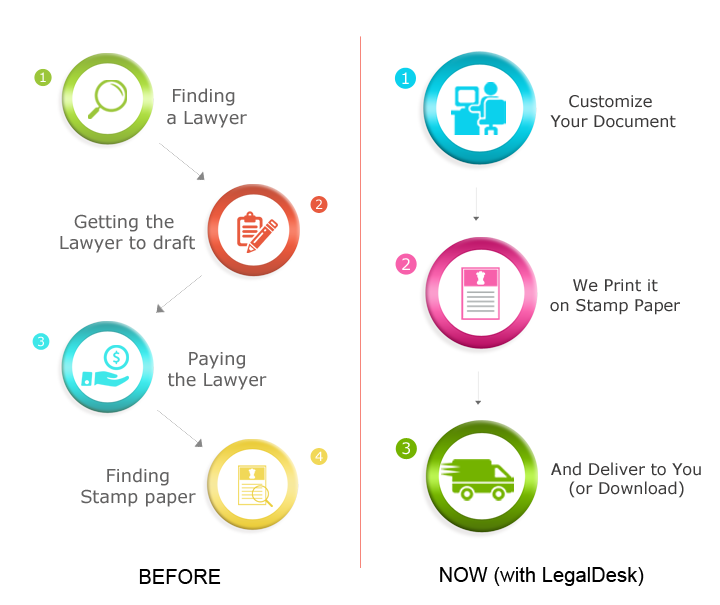 LegalDesk.com offers several ready-to-use legal documents stemmed from our own need for quick drafts. The working is very simple, we’ve taken a lot of effort to keep the difficulty of use to a minimum. We’re sure that even the most technology challenged person will find this cakewalk! How To Create Legal Documents Online? Step 1: Visit our website. Choose from a selection of pre-drafted, customizable legal documents. Step 2: Add names of parties involved, your clauses and customize the document as per your needs and Voila! you’re ready! Step 3: Pay for your deed and either download or get it delivered to your doorstep! 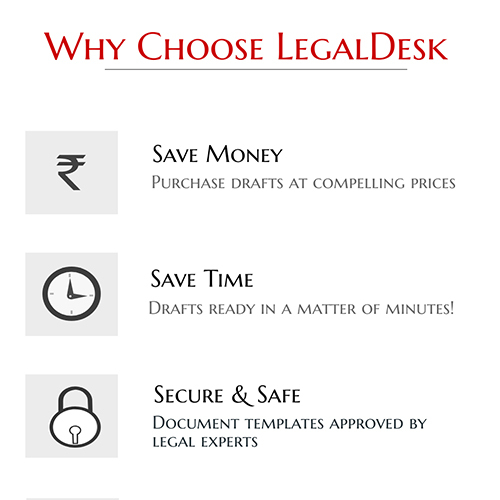 LegalDesk .com assures you that deeds available with us are prepared and verified by experts in the field of Indian Law. With us, you save time, money and hassles of all kinds with just a few clicks! Step 1: Search your city for a reputable lawyer. Step 2: Approach a lawyer to draft the document. The draft will include details about the structure you are renting out, your clauses and the amount you plan to charge. This process may sound easy, but trust us, it is quite difficult to ensure that the document is drafted such that future legal battles are avoided. This is precisely why you need a lawyer. Step 3: Pay the lawyer his fee and the fee for drafting your deed. Step 4: Find a place that issues stamp paper. Buy stamp paper & print the deed. You must’ve observed that this task is not just expensive, but is also time-consuming. This is the case with every legal document you need to draft. And this is also precisely why you need LegalDesk.com.